When the client’s vision is run through a creative mind’s filter, the result is a collaborative outcome that speaks with a distinct voice. Unilab Pharma’s office space designed by SAV Architecture + Design is an echo of this very premise. 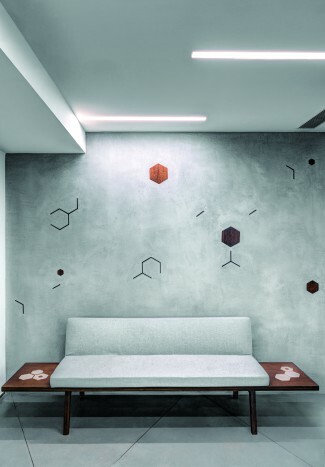 Inspired by the chemical products that the company makes, the architectural team has conceptualised the lighting, furniture and floor patterns in the office, showcasing the different formulae of the products. In an era when work-play campuses are pitted against sleekly designed cubicle farms to capture the corporate imagination, how does an interior designer or architect who wants to make a difference compete?In an era when work-play campuses are pitted against sleekly designed cubicle farms to capture the corporate imagination, how does an interior designer or architect who wants to make a difference compete? By turning a 120 square meter plot in the heart of Mumbai into a spacious office for a leading healthcare brand, London and Mumbai based SAV Architecture + Design answer the question by proving once again that design is not about a whim or indulgence but something that leaves a strong impact even in the simplest of frames. The combination of ordinary beauty, elegant tactility, experiential sublimity and meticulous efficiency is what gives the said project a defining edge. The signature aesthetic that one witnesses in the smart and modern enclosure of Unilab Pharma’s office is raw, yet refined. On first glance, the image of a purely scientific space is perceived and composed of a minimal set of parts and materials. Keeping the open-office concept intact, the design team has very cleverly installed walls in an open space to create a series of rooms and common areas. Hans J. Wegner Shell Chairs and a minimal sofa with inbuilt side tables constitute the informal sitting in the two rooms. 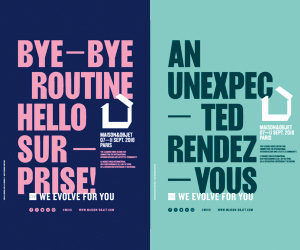 A space becomes personal when it reiterates a story. The creative brains have seconded this notion. 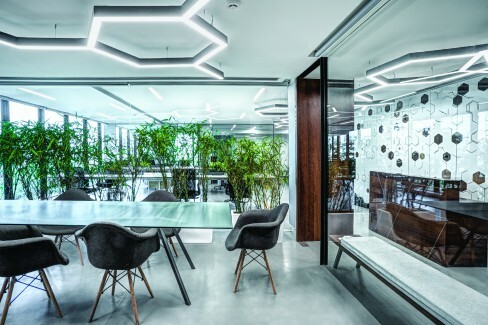 Inspired by the form of chemical compositions, the architectural team has conceptualised the lighting, furniture and floor patterns in the office, showcasing the different formulae that the company uses in making its products. The team says, “Our clients who are well travelled and trade across the world were keen to have both an office with a modern and international feel as well as a calm working oasis within the chaotic Mumbai context.” Keeping this in mind they requested for a design plan that brings a contemporary and fresh feel to the interiors. The interior design scheme focuses on three major layers. The first layer is the seamless concrete floor with an overlaid hexagonal pattern in the form of steel expansion joints that flow across the floor to the concrete wall standing at the entrance. This patterned layer continues as a handcrafted inlay design within the wooden cabinetry of the reception and the partition of the directors’ cabins. 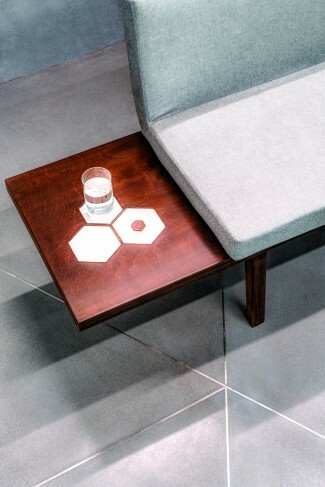 Here the soft, cool concrete and the warm, tonal walnut wood birth another layered contrast of materiality. 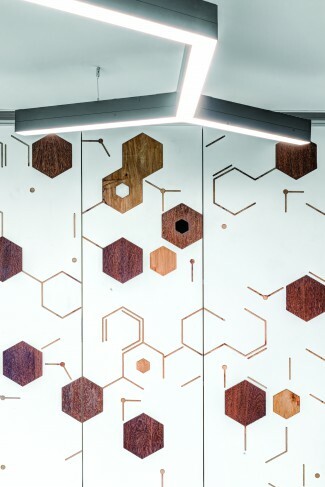 A mix of directional slot LED lights and large hexagonal pendant lights fabricated out of powder coated aluminum into three meter long compositions flow across the space, forming the second layer. The flush doors of the cabinet are designed as a storage wall, to house an archive of company files; these exhibit a dovetailing of laminated birch plywood and walnut, on one side of the reception. Milled with a CNC machine to generate a free flowing pattern of chemical compositions that eventually dissolve into concrete, forms the third layer. The long, spacious meeting room with full-height wooden cabinets sports a three meter long glass table with customised steel legs. The Eames Shell Chairs with an upholstered grey back generate a warm contrast to the glass. 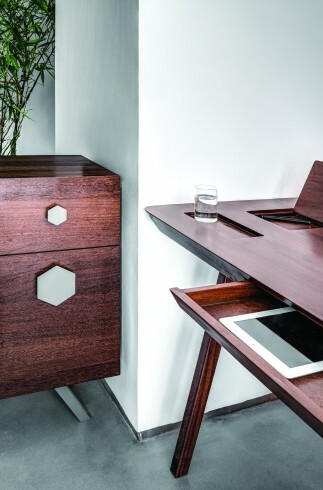 With custom designed desks, the director spaces have minimal furniture crafted entirely out of teakwood. 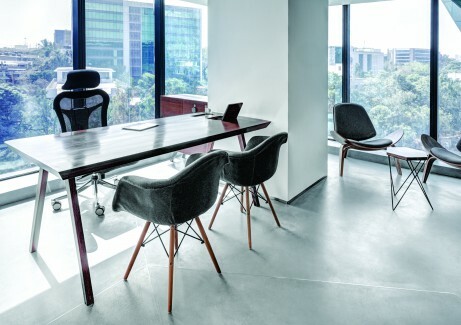 With custom designed desks, the director spaces have minimal furniture crafted entirely out of teakwood. Hans J. Wegner Shell Chairs and a minimal sofa with inbuilt side tables constitute the informal sitting in the two rooms. 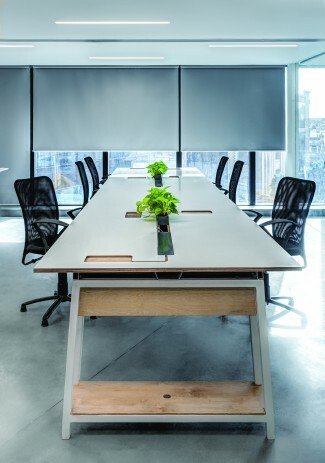 The work surfaces are custom designed, four meter long modular desks with central planters and concealed cable trays that allow for an expansive and flexible feel. The toilet, pantry and storage facilities are accessed through a flush door hidden in the cabinet wall that helps shape the clean angles of the office. 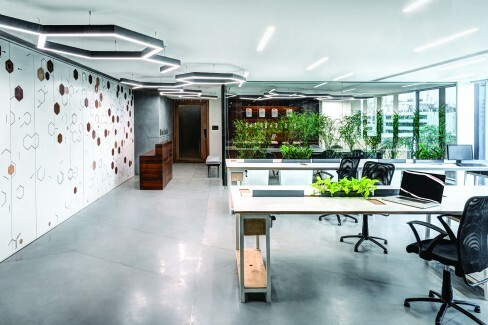 While the washroom carries the same minimal look clad in concrete tiles, tall bamboo planters introduce an organic and green feel to the office.Passion alone doesn’t drive extraordinary achievements; it has to be backed by dedication to leave a mark. The first layer is the seamless concrete floor with an overlaid hexagonal pattern in the form of steel expansion joints that flow across the floor to the concrete wall standing at the entrance. “Made with a mix of traditional carpentry and new computational technologies, the design emanates an understated, bright and stylish feel,” says the team. To summarise, it is all about a dynamic and chic interior design, made possible by collective imagination!